Our Abpromise guarantee covers the use of ab7208 in the following tested applications. For sandwich ELISA, use this antibody as Detection at 0.5µg/ml with ab20101 as Capture. Standard curve for Leptin (Analyte: ab51273); dilution range 1pg/ml to 1µg/ml using Capture Antibody Mouse monoclonal [BDI170] to Leptin (ab20101) at 1/200 and Detector Antibody Rabbit polyclonal to Leptin (ab7208) at 0.5µg/ml. 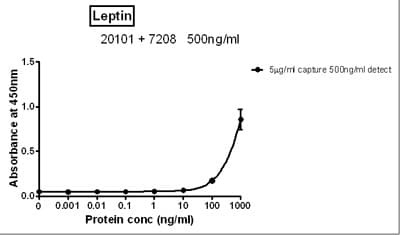 Concentration of Mouse monoclonal [BDI170] to Leptin (ab20101) may vary from lot to lot; please use this curve as guideline. Publishing research using ab7208? Please let us know so that we can cite the reference in this datasheet. I would like to set up a sandwich immunoassay for leptin, employing either HRP or fluorescent nanospheres (prepared in my lab) for detection. Do you think I could couple the AB6055 raised in mouse (to be used as a detection antibody) with the AB7208 raised in rabbit (to be used as a capture antibody)? If so, do you think I could also employ my nanosphere-labeled anti-mouse secondary antibody to bind to AB6055 instead of using HRP for detection? The HRP conjugated anti-Leptin ab6055 has been tested in sELISA with ab6057 (https://www.abcam.com/ab6057). We do not have any data for the pair ab6055 / ab7208. I would not recommend to use a secondary to detect a conjugated antibody. ab20101 / ab7208. Both antibodies are unconjugated: https://www.abcam.com/ab20101 and https://www.abcam.com/ab7208. ab6056 / ab36498. Both antibodies are unconjugated: https://www.abcam.com/ab6056 and https://www.abcam.com/ab36498. Weneedtwo different types ofanti-leptin antibodies for human milk samples, that each ones recognize different epitopes; and a third antibody anti-Ig against the animal where the anti-leptin antibodies were produced. Wich of yours products do you recomend me? We'd like to know exactly the price of each product, the quantity/volume,how long will it take to arrive to Mallorca and if it's only for investigation because we want to introduce it in a commercial instrument. We have a number of different antibodies directed against the human Leptin protein. The ideal choices for your experiment would depend on what application you are hoping to use. We have several antibodies which are able to detect different epitopes from the Leptinprotein such as ab50424 which is a goat polyclonal raised againsta synthetic peptide derived from the residues 829-841 of human Leptin. This antibody has been used in ELISA and western blotting. The antibodyab20101 (mouse monoclonal)has been raised against the peptide taken from residues 131-145 of human Leptin. This antibody has been used in sandwich ELISA, Western blotting and IHC. The antibody ab20101 was used as an ELISA sandwich pair with the rabbit polyclonal ab7208 which was raised against the full length human Leptin protein. The standard curve was performed using the recombinantly expressed human Leptinprotein (ab51273). In order to advise which secondary antibody (anti-IgG of host animal) would be suitable, I would need to know which conjugate you would like to use in your assay. It would also be helpful to know the application in which you wish to use the antibodies. If you could provide me with this information I will be able to advise you further. If you could let me knowwhich antibodies you'd be interested in I can also let you know the delivery time and how much antibody would be provided (alternatively this information isavailable on the datasheet of each product). All of our products are for researchpurposes only and are not intended for diagnostic, therapeutic or in vivo use. I hope this information has been of some help. If you require any further information please do not hesitate to contact us again.